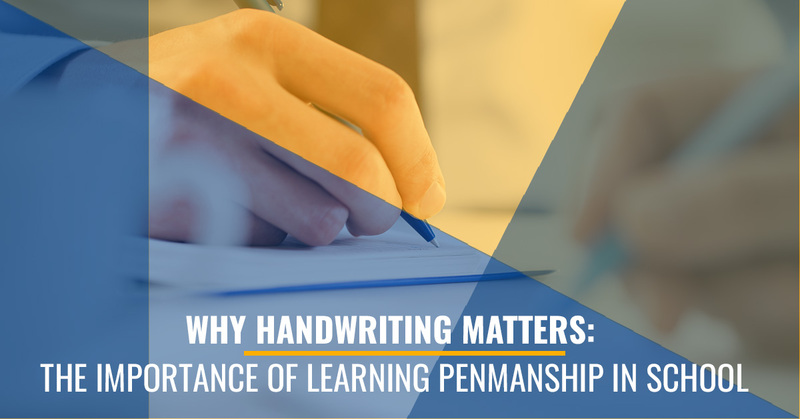 In a digital world that focuses on screens over paper and typing over writing, some argue that learning to write is is an obsolete skill and less emphasis should be placed on handwriting. However, many studies have shown that there is still value in learning to write —pen(cil) to paper, and well. Here, we will discuss a few reasons that handwriting matters and why penmanship should still be taught as an important skill in school. Good handwriting can be directly correlated to better academic performance. Several studies have been conducted concluding that there is a strong causal link between good handwriting and a child’s academic performance. In one study, it was suggested that children who learn good handwriting skills at an early age have higher grades in reading, writing, and math as compared to their peers who were taught typing skills over handwriting skills. There are several theories as to why this is the case, including the fact that writing and typing engage different parts of the brain. Others theorize that the repetitiveness of writing helps children to better remember information and to learn to spell rather than relying on technology to continually correct grammar and spelling. Handwriting information makes it easier to remember. When you hand write something, be it notes on a new subject or a grocery list, the chances of remembering it are much higher than in you type the same information, hear it, or speak it. Putting pen to paper and writing requires your brain to think about it more and helps your brain process the information. Taking notes on a computer or tablet actually hinders academic performance because notes tend to be taken verbatim as “mindless transcription,” rather than what the writer actually processed the information as. Taking the time to write the information makes the task a holistic event, including motor and neurological skills that help process information better and allow for better interpretation and easier recall. For children and adults alike, if there is information you are struggling to understand or remember, write it down. Writing will always be a necessary skill, doing it well will help! While we are quickly advancing in the technological world, handwriting will always be a necessary skill. Whether it is writing your name, making a to-do list, or signing a card, there will likely never be a day when you must write nothing. Being able to write well will help your writing be legible and make life easier for both the writer and the reader. When a child learns good penmanship early on, writing seems like an effortless activity as they age which saves struggle and anxiety when the skill is required. It would be unfortunate to not be able to express yourself because your technology has failed! Penmanship is a way to express oneself. Aside from the words that are written, handwriting is an expressive form of communication. Each writer has a distinct language that is translated through their penmanship that tells of their unique qualities. When writers are limited to font options, it is the same as the spoken word being limited to the digital voice options. Penmanship is a form of personal art and it is important not to restrict this outlet of expression to simple keystrokes. For now, at least, handwriting is still an integral part of school studies at all ages. However, with the introduction of digital teaching options and advancements in technology, it seems to be a fleeting area of importance. In many schools, cursive is not being taught and the importance of good penmanship has been devalued. At Mizzentop Day School, we know the importance of good penmanship off the paper and choose to continue to teach and mentor our students about the value of writing well. We value education as more than memorizing facts, but as nurturing the total student. If you are looking for values-based education at a private school, for your child, contact us today! Why is Handwriting Still Important in the Digital Age?